If you’re going on a beautiful kayaking trip chances are you’re going to want to record it. whether it’s Washington state , Connecticut ,Maryland, or any of the other incredible states, America is full of beautiful places to kayak. Whether it be gliding down beautiful serene rivers or plunging off roaring waterfalls, it’s understandable that you want to be able to share the experience with your friends and family. With so many people recording sports footage through the use of GoPro’s now there are loads of options on the market for different ways to mount your camera. So, we’ve gone through the options available and can bring you the best GoPro kayak mounts on the market in 2019, an accessory that has surely become, kayaking essential. The RAILBLAZA camera boon is an extendable GoPro mount that allows you to position your camera up to 30 inches above your boat. Designed with fishing in mind this mounting system attaches to RAILBLAZA mounts which are sold separately. The mount itself offers a huge amount of flexibility, 5 separate joints allowing multiple different camera angles. The various interlocking joints are possible to release and tighten manually meaning it is easy to adjust your camera on the go. Overall the RAILBLAZA is sturdy and thoroughly adjustable mount providing a significant wide-angle camera position for your video. 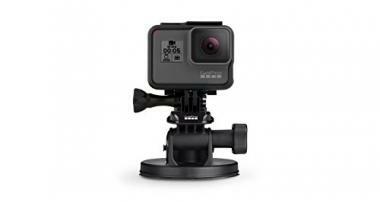 The GoPro suction mount is worth the consideration of anyone with a GoPro. Not only does any model of GoPro easily attach to it, but the mount can be can easily be attached to any surface with an industrial strength suction that is proven at speeds of up 150mph. The highlight of this mount is its ease of use. Incredibly easy to move from one point to another, it will hold your GoPro sure and safe on any even surface. The mount itself comes with adjustable arms included a quick release bag and drawstring bag. Proven to provide suction and stability at speeds of up to 150mph. The Scotty portable camera and compass mount provide a range of movement and adjustments that mean that you can angle your camera in any direction that you want. Furthermore, the mount is able to be twisted into a compact and transportable shape. The mount fits any Scotty mount systems and can handle poles up 1 3/8'' in diameter. Scotty makes holders and mounts specifically for aquatic activities and therefore know the importance of safe and secure equipment. Multiple angles provided by a highly adaptable mount. A clip-on mount in the gorilla style. 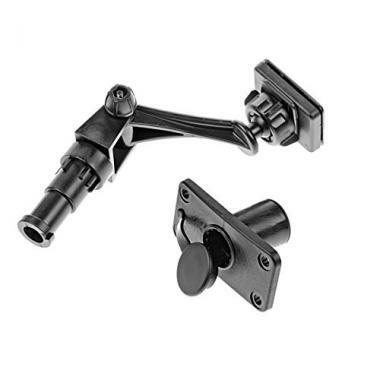 These mounts are highly adjustable and very sturdy. The nineteen sections allow for a huge amount of bend whilst remaining strong and secure. The gooseneck itself can be split into two sections making it even more adaptable. The mount can be secured to any surface between ¼'' and 2'' making the jaws versatile and possible to use in a number of situations. The jaws themselves also include a rubber strap attachment which reduces camera shake whilst filming. The Brocraft kayak portable camera mount mounts is a screw mount with a 9-inch extendable pole. The mount is therefore secured by screws to any surface you choose creating a very strong and sturdy base. The pole itself can be adjusted in a number of different sections, with a 360-degree adjustment on the head of the mount. 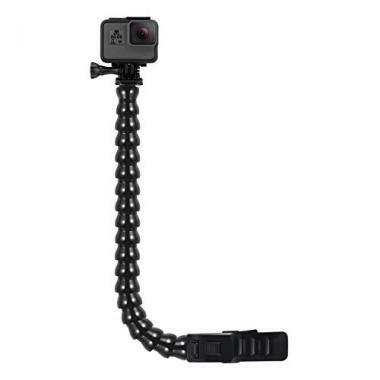 The package includes the 9-inch extender pole, deck/side mount, GoPro mount as well as stainless steel screws for fastening the mount. Sturdy screw fastened base included. This kayak mount is great for recording your summer kayaking adventures. Designed to fit into adapters that come as standard on many kayakers, it’s worth checking if you have one of these mounting points already available on your kayak. This small but versatile camera mount attaches to Scotty adapters fitted at various points around your kayak. An uncomplicated mount that features a universal ball adapter for your GoPro and a 360-degree rotating base. This camera easily mounts to either the rear or front of your camera and can provide multiple angles. Very rigid once adjusted and in place, the mount simply attaches to ports that should already be found installed on your kayak. Scotty mount adapter fits easily into ports already available on your Kayak. 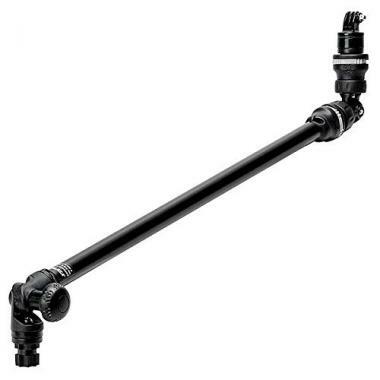 Universal ball joint provides versatile positioning options for your GoPro. What should you be looking for when buying your GoPro Kayak mount? Any mount mounted to a kayak is going to need to be water resistant. If the build quality of a mount is not up to scratch, then water damage will make it fail very quickly. If that happens, you risk losing not only your mount, but also your camera. Always check to make sure that any mount you look for is water resistant. Different mounts, of course, come in different shapes and sizes; they were not all created equal! 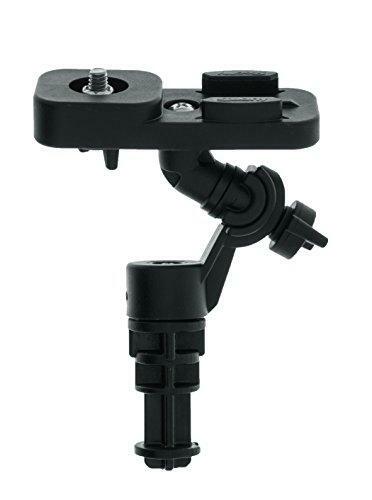 Some mounts, like suction cups, do not require any pre-installed gear tracks or mounting points. Many other mounts, however, do require pre-installed gear tracks often drilled into the body of fishing kayaks. Although this process can take longer and be more expensive, the gear track only needs to be installed once. Furthermore, mounts attached to gear tracks will often be more stable and secure, as they are attached to a base that is drilled into the kayak. Gear tracks and mounts come in multiple shapes and sizes, and a mount for a kayak camera of one brand will most likely not fit in a gear track or mounting point for another brand. Some of the most common and which a lot of camera mounts are designed to fit onto are RAILBLAZA and Scotty. Camera mounts will most likely state which gear tracks and mounting points they are compatible. A final point to consider is how the camera itself mounts to the camera mount. Again, mount manufacturers want to direct you to make the right choice, therefore any mount that connects to a GoPro will most likely tell you in the description if not the title. If the camera mount doesn’t have any specifications on how it mounts to your camera, the chances are it’s a standard tripod mount, which is a thread that screws into the base of your camera. How sturdy are Kayak Camera Mounts? Unfortunately, there is no simple answer to that question. The best kayak GoPro mounts are sturdy enough to be put through their paces by professional kayakers going over huge waterfalls, however not all will be up to the task. Luckily enough, the average kayaker does not need their kayak camera mounting to go through such stress. The sturdiness of a top-rated kayak camera mount is determined by its size, shape and mounting system. Some of the best Kayak GoPro mounts may compromise sturdiness for better camera angle. For example, mounts with extendable poles will be less sturdy, and may not be capable of handling an Eskimo roll. There will always be a compromise between the length of the camera mount and the sturdiness. If you expect to be paddling in rougher waters, it is best to look for a camera mount that attaches to a gear track or mount that screws into a boat. 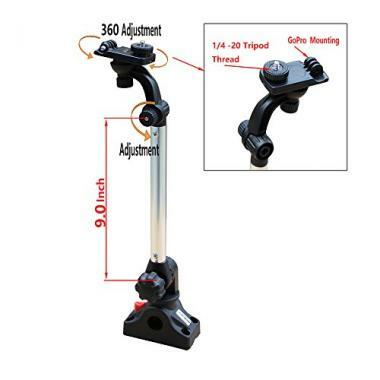 This will always provide the sturdiest and securest mount for your boat. As long as you know the compromises that different sizes and shapes of mount make on a boat, you will be able to pick the top-rated kayak camera mount for you. Camera mounts are as safe as your kayak is! It all depends on you use it. If you’re are paddling and looking to film a scenic journey, any mount for your kayak camera Is safe. If paddling in rougher water, however, it is important to recognize that long poles will not be able to cope with larger amounts of stress that occur. If a long pole hits a rock or the river bottom during a faster period of water, it is likely that it will break. Despite this, there is no risk of injury to a person. Kayak cameras are regularly used for all sorts of activities, and they pose no risk to the safety of the paddler if used correctly. Do I Need Any Preparation Before I Put In The Camera Mount? Some camera mounts need more preparation than others before attaching them to your Kayak. It is always best to trial out attaching your camera to your boat before heading out on a journey or excursion. This saves time and ensures that you don’t arrive at the start of your kayak trip and either doesn’t know how to attach the camera or attach it badly that it falls off. A helpful way to learn how to attach your camera is to read kayak GoPro mount reviews. These reviews will help you to understand what tools and how difficult it is to attach a camera mount. Another useful tip is to assess what kind of kayak you own. Certain types of fishing kayaks may come with attachments built in. Sit top kayaks, on the other hand, may have holders positioned in other places. The advice is therefore that you do need preparation before you attach your camera mount. Mounts that attach gear tracks require the most time, but it makes sense to spend some time acquainting yourself with any kind of kayak mount that you choose. With personal adventure footage becoming more and more popular, the number of different GoPro mounts for kayaks on the market has increased hugely. There are mounts for all types of different experiences and styles so it’s important to consider what you’re looking to use the mount for before you buy. Longer poles are perfect for more casual videos. Maybe you want to make a time-lapse as you glide down a calm and peaceful river or point at sunset as you sit and enjoy from your kayak. The longer mounts are perfect for jobs like this but aren’t going to be the weapon of choice for the rough-water kayaker. If you’re looking to go through some white water, or maybe review your technique then there are a number of GoPro mount alternatives to suit your needs. Whatever the case, in this review we cover all the different kinds of mounts that are sure to be one of your best kayaking accessories.